Boy Scouts of America (BSA) reject lesbian den mom-wannabe Terry. A number of protests followed. Terry went on to encourage LGBT parents to enroll their children in 4-H, asked the Portland United Way to de-fund the BSA of an estimated $82,000 a year, and asked local schools and public services that are supported with tax dollars to decline to provide the BSA with meeting space. 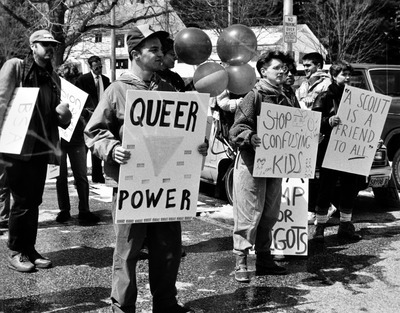 Image description: Protests BSA Portland headquarters in May 1992. John McLaughlin (second for right) hold the sign "Queer Power" other signs read "Stop Confusing Kids", and "A Scout is a friend to ALL"